Citation: C N Trueman "Henry VIII and his inheritance"
What did Henry VIII inherit when he became king in 1509? His father, Henry VII, left him with a country that was more united than it had been in 1485. The threat of rebellion amongst the people did exist but the state was more stable than it had been for centuries. Henry VII had effectively tamed the nobility so that it worked for the king rather than against it. Men of ability carried out central and local government as Henry VII had ensured that posts were open to those who could do the work competently as opposed to gaining positions as a result of family connections. The king was, by 1509, a far richer man than any former English monarch. Henry VII’s concern and care over money is well documented by historians. When Henry VIII was crowned king, his income was well above that of previous English kings – but less than the likes of the kings of France. At an international level, England was in a stable position and respected in Europe. Henry VII had been a skilled diplomat and kept England out of major European conflicts. Spain was seen as the dominant European power and the marriage arranged between Prince Arthur and Catherine of Aragon, ensured that both nations remained on good terms – especially when the newly widowed Catherine married Prince Henry and was to shortly become Queen Catherine in April 1509. 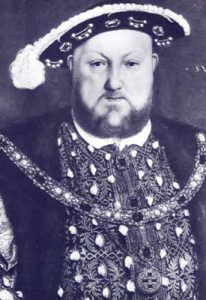 Therefore, Henry VIII inherited a state that was united behind the monarch, a state that had a decent European reputation, a monarchy that was wealthier than it had been for centuries, a nobility that had been tamed and made to work for the Crown and a system of government that was competent and effective.